This weekend cannot get here soon enough... it is time to go back to Perry Park! I'm so excited to spend the weekend scrapbooking, teaching, eating, and generally getting goofy with the gals. The weather is supposed to be mild and that's perfect for some long calorie-burning walks. This is one of the classes I will be teaching this weekend...super cute Santa Boxes. I wish you the most wonderful weekend , teaching some of your beautiful and fun art pieces-have a great time, dear. How did I miss this post! 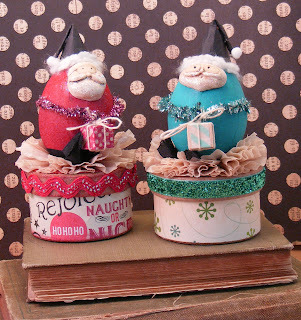 These are adorable...I bet everyone loved making these jolly old elves!